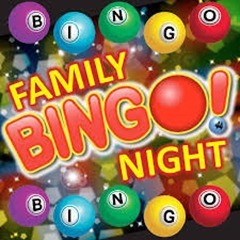 The Bingo night on Friday night was a wonderful celebration of family, friends, fun and student leadership. Our Student Council members were exceptional in their management of the evening with the wonderful support of our PTA. The Student Council epitomized our AAROW characteristics of Achievement, Agency and Respect. If you missed this one, I am hoping we can have another this year. It was simply magnificent. Last week, six staff attended the Positive Schools Conference at Renaissance College from Thursday to Saturday. The conference reaffirmed our determination to create a learning environment that celebrates student wellbeing, intrinsic motivation, growth mindsets and meaningful learning experiences. Already our team are bursting with ideas to support our strategic goals and short-term targets. Finally, it’s camp time! 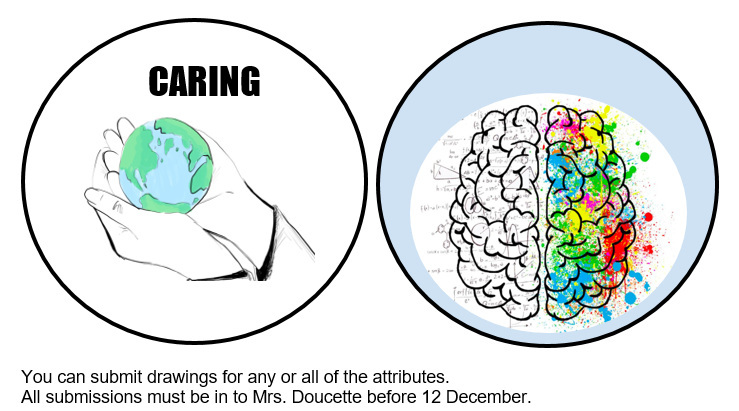 During this week, Year 5 children have the opportunity to be courageous, take some risks, be open-minded and caring (see our PYP values). Next week, it will be our Year 6’s turn. 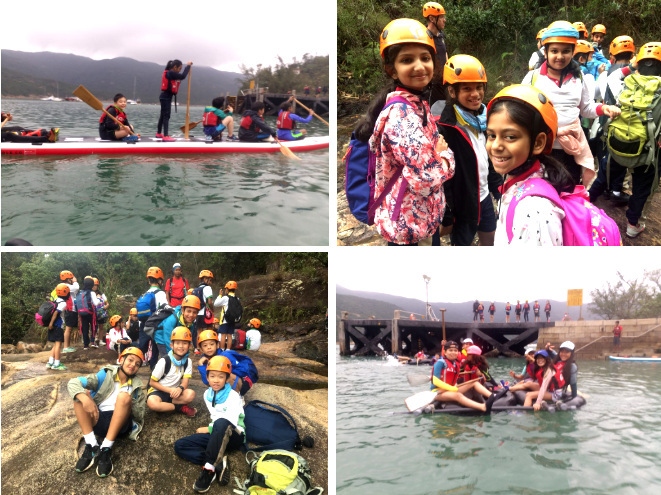 Our school camps allow children to experience the outdoors, try new experiences, be away from home but in a safe environment with friends and staff, try new food, and be outside of their comfort zone. I will be joining the senior leadership team at camps over the next two weeks so we hope to send you some photos of the children having success in a different environment. A special thanks to all of the staff who give up their own family time to be with our KJS children 24 hours a day over a period of 4-5 days. They are an incredible team! As in previous years, we have arranged a photographer to come in and provide a photo-taking service to staff and children. An order form with a sample student photo were distributed to each child today. To increase efficiency, you are encouraged to order photos online. Group photos and funny class photo are available to view online only. If your child has not taken an individual student photo and would like to do so, please contact the photographer directly and make a booking to take the student photo at their studio.Techni Photo (TP) is an independent organization and Kowloon Junior School (KJS) takes no responsibility for any services or goods provided by TP or any other organizations that are not affiliated to KJS or English Schools Foundation. Over the last few weeks, our students have been preparing for their Sports Days to be held in the final week of this term. These are exciting opportunities for students to showcase their athletic ability in a safe and fun environment and to promote the importance of physical activity during our wellbeing focus week. 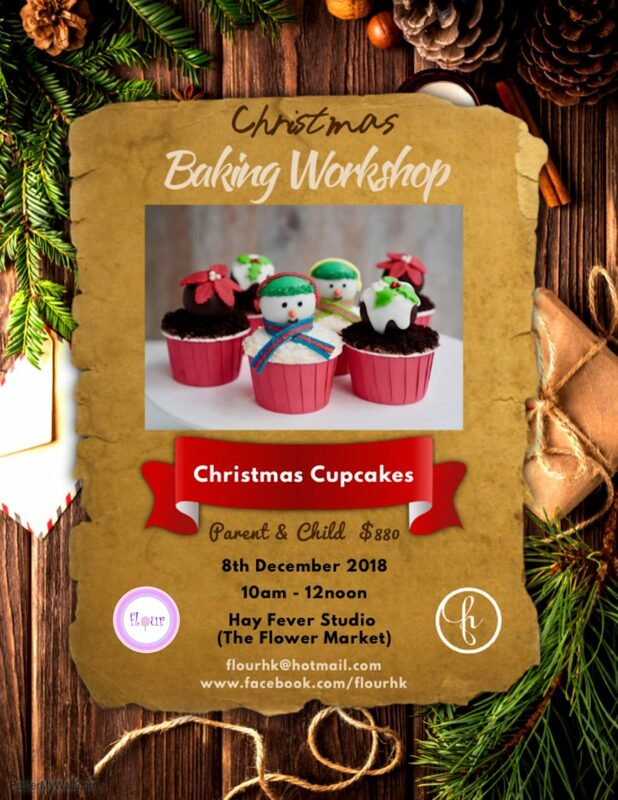 Parents are encouraged to attend and support the children. Please see details below. Tuesday 11 December – Y3 from 9:30 am – 11:30 am; Y4 from 12:15 pm – 2:15 pm. Wednesday 12 December – Y5 9:30 am – 11:30 am; Y6 from 12:15 pm – 2:15 pm. To add to the colour and excitement on the day, please wear the colour of your child’s house team. We have been invited, along with a number of other ESF schools to participate in the first ever Kid Power Programme in the Asia Pacific Region. This programme encourages students to get active (vital for our wellbeing) and support UNICEF at the same time. This is an exciting initiative that all children can be a part of. For a fee of HKD100, our students are invited to enroll in a physical activity programme taking place from 1 March to 31 May 2019. 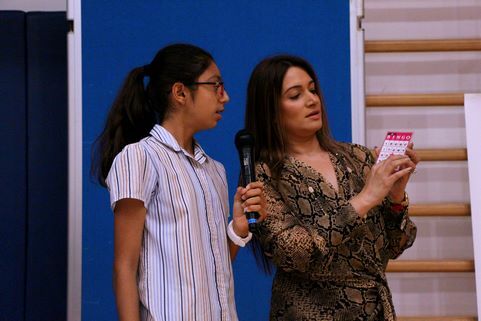 Participants are provided with a step tracker which measures their steps and movement for the period, earning Kid Powerpoints used to purchase essential food packets for children suffering malnutrition in famine-affected areas of the world. Please note – this is organised by UNICEF; participation in this initiative is completely voluntary. Sign up details and specifics about the programme can be viewed by clicking here . Thank you to all the children and their families who came to participate and support this event. We had a great turnout with families enjoying the pizzas, donuts and Jain food that were served and then moving into the school gym to play Bingo. Thank you to the Year 6 Student Council students who helped us conduct the game. 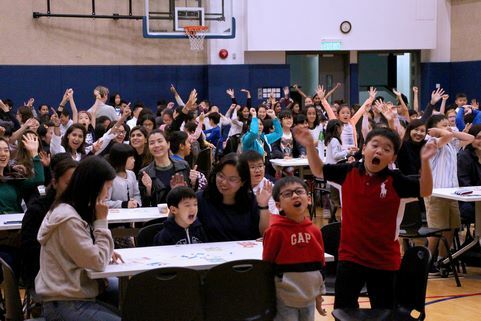 From calling out numbers, to circling around the school gym to ensure participants were following the rules of the game, to making sure winners all had the correct numbers crossed out – the council members conducted the five game played with ease and some laughter. 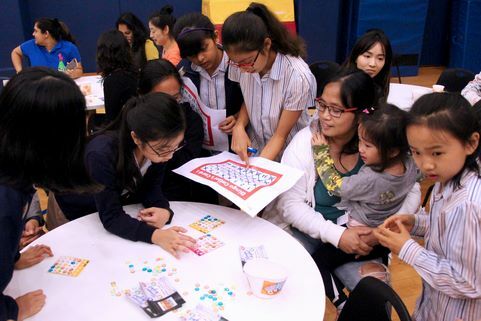 Everyone had a good time and with Neill, our Principal, encouraging parents to purchase more Bingo tickets, the event was very successful. Thank you to Neill. Congratulations to all the winners of Bingo. 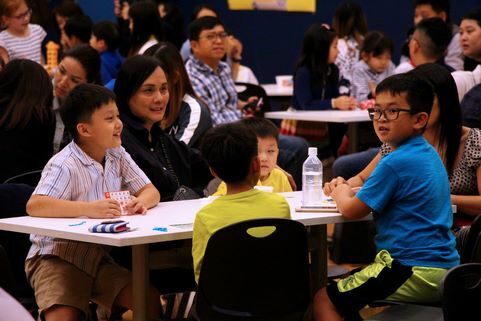 We welcome parents who would like to be a part of our events. If you would like to promote your business by renting a stall at any of our upcoming events, please do let us know. 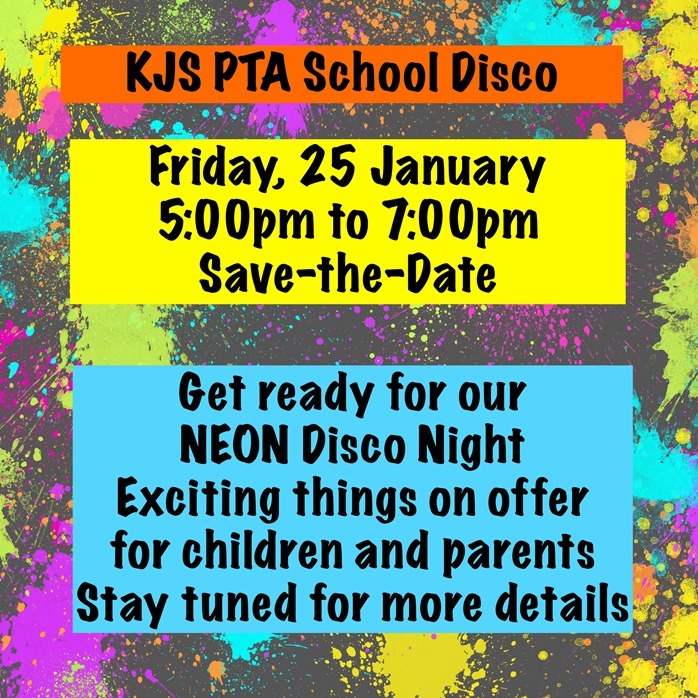 The PTA email address is pta@kjs.edu.hk. 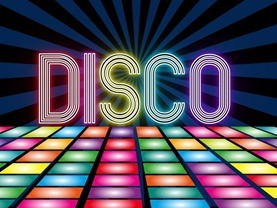 Our School Disco will take place on Friday, 25 January 2019. Tickets will be on sale soon. Please Save-the-Date. This is a popular event and you won’t want to miss it. ‘KJS Green Dream’ – that’s the theme for our School Fair on Saturday, 16 March 2019. Our objective this year is to make KJS a sustainable school and proceeds from the fair will go towards this cause. We need your help – we need volunteers before and during the fair and we need parents to form teams and lead International food stalls. 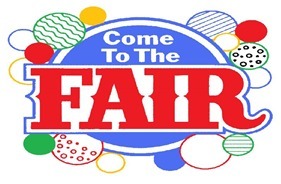 To make our fair even more successful, we need your donations and sponsorship. If you would like to help in any way, please approach the PTA office. Thank you to all our wonderful parents for supporting the PTA.